Hey guys,here I am feeling really happy on my achievement which may seem small to you but is really a milestone reached for me. I enjoyed writing very much .It’s the only thing which gave me pleasure and peace .I have written many poems and articles but never shared on any writing platform as I never felt confident enough but then I took an initiative to start my very own virtual space. A huge thanks to WordPress which gave me such a brilliant user base from all over the World .I then started reading blogs and loved all of them which gave me motivation and a desire to write more as it gives me a delight .Words can’t express how elated I felt when I got likes and comments from my dear readers .I’m blessed to have a such a reading and writing community on WordPress .Hands down it is one of the most easiest way to connect with a whole new community. 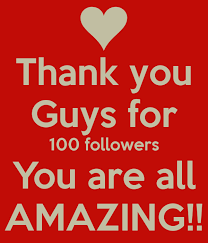 Thanks to all my readers from my team through the core of our hearts to support us ,inspire us in this journey.I will try my best to entertain you with my posts.Please keep supporting us in this journey and shower your blessings on us. God Bless You and have a blissful life. I would like to give credit of my achievement to our team. Thanks to u too ,infact all of readers .A big congrats to all of us. Congratulations!! It’s a big achievement from my eyes !! Congratuations. Thanks for the follow, and welcome to pensitivity101. Hope you find things of intetest and will add your comments to my posts. I love the interaction and feedback. Thank u for reading and following my blog .A Hearty congrats to all of us .I enjoy reading your posts . COngratualtions. I’m sure you’ll get many more followers. Cheers! Thank u so much .Cheers to all of us ! well done to you and your team, from lincolnlifesite, keep writing and keep growing. Continued best of luck and hope to find out what your blog is about next time. . .
Congratulations! May you inspire and fascinate many more people, like you inspired me! I’m grateful to be one of your readers! Be blessed! Thank u so much .I m glad to hear that we inspired you . Congrats to all of us team (including followers). There is a flow in your writing…also when I got my first 100 which was not long ago I jumped out of my virtual space to reality…Read, Write, and Repeat became my religion which I have been following since December of 2016. Congrats and wishing you many more zeroes after 💯! Thank you so much for your beautiful comment.You made my day today . Would you share your idea Read,Write,Repeat in detail please? Well…I meant read more like books, blogs, and keep writing These days I try to read and write …earlier it was more of reading. We have to do both…that’s the lesson Learned for me. Yes ,thanks for advice.Now a days ,as its my holidays .I’m spending more and more time in reading and writing. Thank you so much mam😍.Have a good day. Congratulations. I have nominated you for the Mystery Blogger Award.